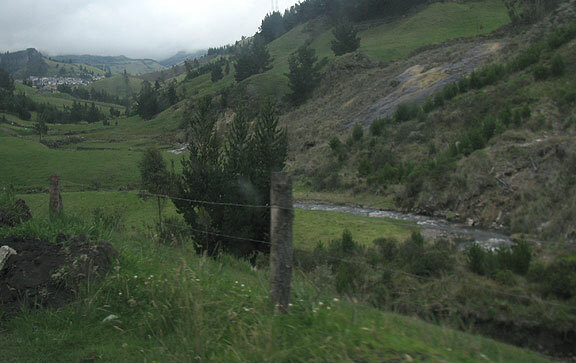 From Guaranda we rode in the back of a Camioneta to Salinas de Guaranda, a little over an hour further into the brilliant green mountains of the Ecuadorian Andes. 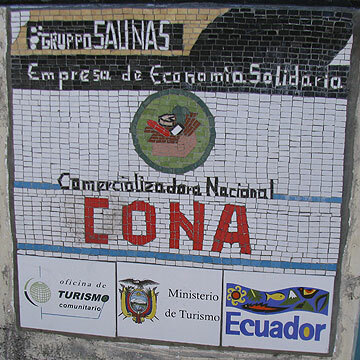 We’d heard it was a remarkable place, a town far from the tourist track full of cooperative small businesses. 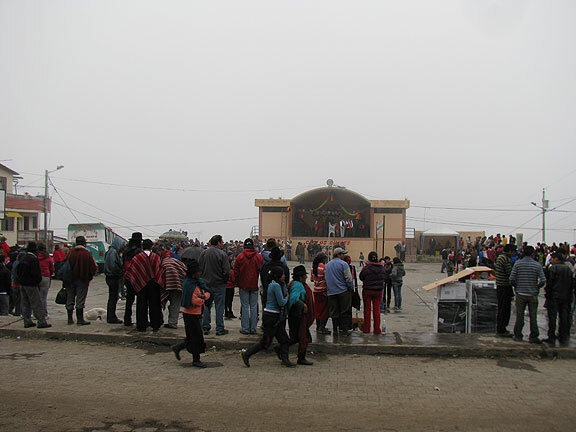 We travelled in gray, increasingly wet weather and arrived to a big Carnaval celebration in the town center. Salinas is tucked in the upper left corner of this image, still several kilometers away as we approached. The town square where folks had gathered despite the rain to enjoy live music and raffles and Carnaval celebration (and much drinking!). 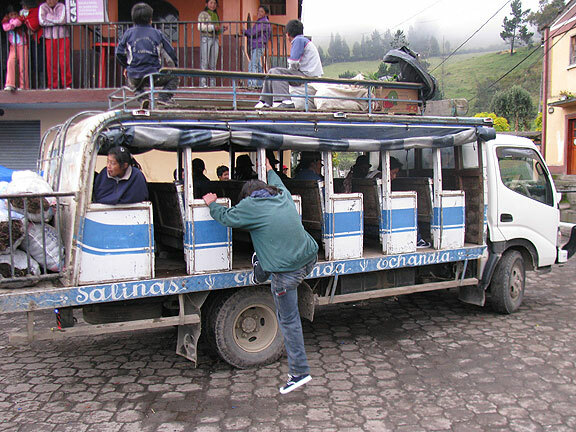 ...While dozens of others arrived in these old mountain buses. 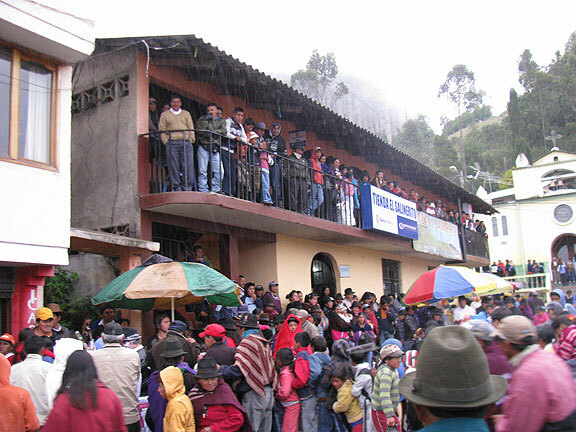 We dropped our stuff at the local hotel, El Refugio, one of the network of cooperatives, and ran back to the center to join the fun. 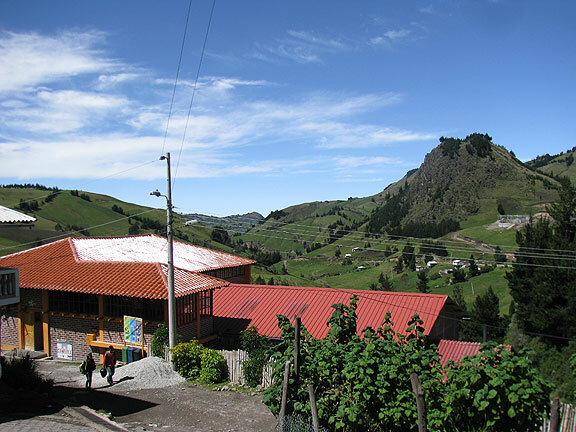 We strolled around and listened to the music, talked to some locals, and got a taste of the local fire water, Pajaro Azul, a perfumey cane sugar-derived drink that packs a wallop! Soon the drizzle turned into a real downpour and everyone bolted for the balconies along the side of the square. 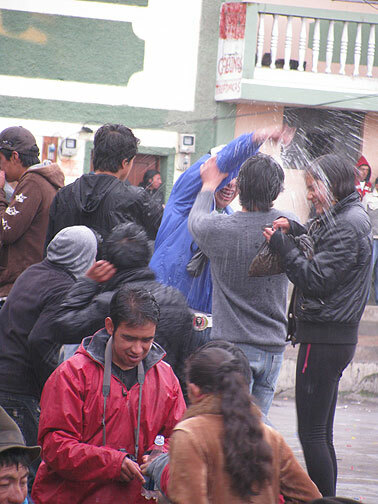 The rain didn't really impinge on the celebration much, since throwing water on each other is one of the main celebratory activities here, as it was in other Ecuadorian towns. Water balloons and rain, a soggy celebration! We took a break from the rain and darted into a nearby restaurant, which was deserted when we entered. 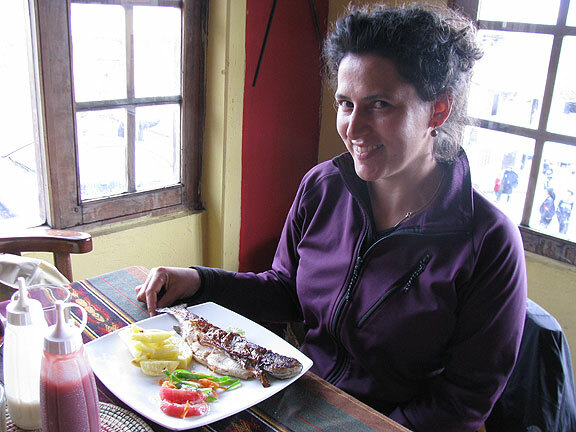 Somewhat grumpily the proprietor appeared from the back and we were able to order dinner: fresh trout. We found out later that the trout was from another of the local coops, the trout farm. Cold, wet, and a bit tired, we thought this simple, fresh trout dinner was one of the culinary highlights of the trip to this point. After dinner we went back into the drizzle and, with a bottle of our own Pajaro Azul to keep us warm, we joined the dancing in the square. Eventually the two dozen remaining dancers crowded onto the gazebo to get out of the falling rain and finished our dancing with a DJ on stage… The next morning we awoke to a spectacular sunny day. Here’s a couple of views from our room balcony. From our balcony: the red-tiled roof is the local chocolate-making coop, and at right are the ancient saltworks from which the town gets its name. Turning left from the same balcony viewpoint, this is Salinas basking in the morning sun. We found the Tourist bureau office on the town square when we arrived and learned we could take a tour of the town’s coops the next morning. So we got there on time and embarked on a fantastic 3-hour walking tour of this prosperous and harmonious town’s thriving cooperatives. The story we learned is that it all started in the early 1970s when an Italian priest, Padre Antonio Polo, arrived from Italy (he had been sent away by the Vatican for being too radical) and immediately started organizing locals who up to then had been nearly enslaved by the local big landowner, forced to work in the saltworks for a pittance. Father Polo helped locals to establish a cheese-making coop (it still employs about 90% of local residents in some capacity). Years later, a Swiss visitor helped teach them how to make Gruyere, Parmesan and other varieties of cheese, which they now sell far and wide. 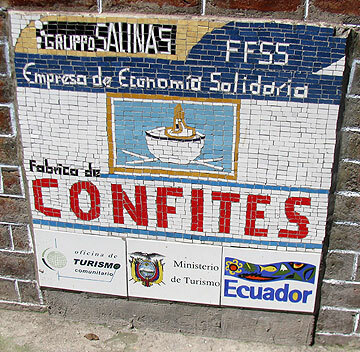 These pretty tiled signs adorned all of the 18 cooperatives in town. 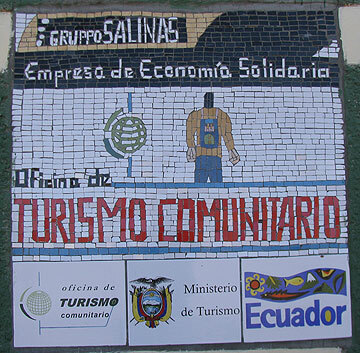 This is the Comunitarian Tourist Bureau's. 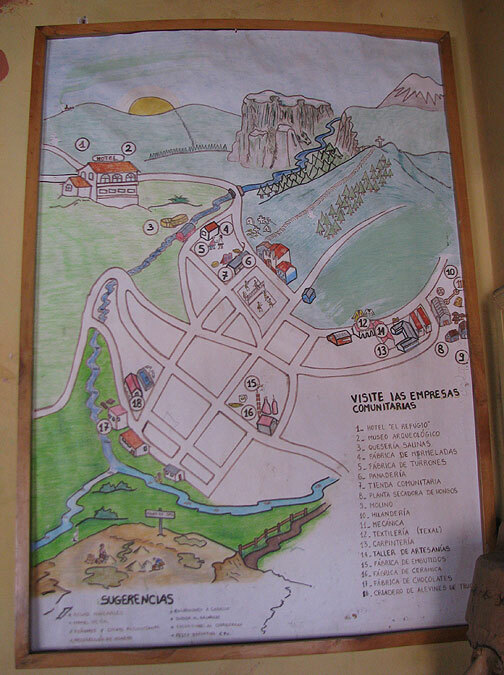 This map on the wall of the Tourist Bureau shows the coops around town, and the key at lower right lists them. So off we went, first stop the cheese factory, a super clean, modern place, with gleaming chrome work tables, tiled hygienic pasteurizing rooms, etc. This is the parmesan cheese aging facility, which was actually across town from the cheese factory, and had its own name, Cona. The parmesan cheese processing coop. 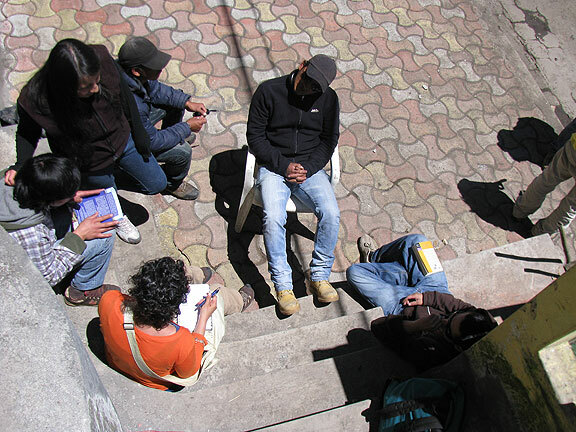 We were interested to know how the different coops related to each other, whether or not there was integration horizontally among the different entities. Did they share profits? Did they provide loans, labor, resources among each other? We learned there was a coordinating council of about 5 “managers” in each coop, and that they sent one representative to a town-wide council to plan the relationships and profit/resource allocations. Our guide was very well informed and explained it all to us as best he could. 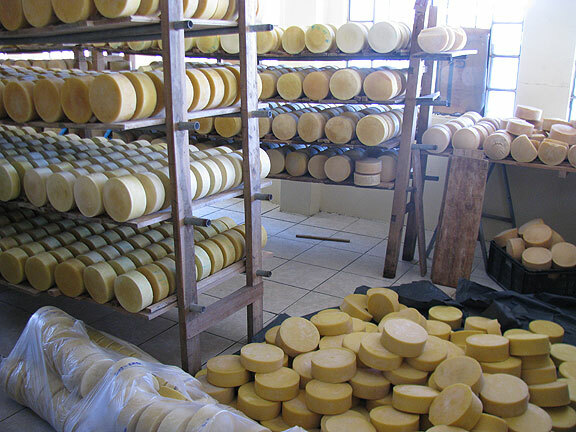 Most of the locals work with the cheese coop, which is much larger than any of the others, but thanks to their success, they’ve been able to reinvest in starting many of the other coops, and help them survive the start-up periods. Another larger and more successful (in market terms) coop was the chocolate factory, and again there was a funny Swiss connection. When they started the chocolate factory they got some international money and investment from a big Italian chocolate company, who in exchange got a long-term contract for raw chocolate paste. That turned out to be a pretty unequal deal for the locals so when some Swiss visitors saw what was happening, they offered to help. They had worked in chocolate production Switzerland and were able to show the Salinas coop how to take their raw materials and produce very high quality, fancy chocolates. We bought a bunch, including some filled with Pajaro Azul, dark chocolate candy bars with rock salt, and more. The Chocolate Factory sits at the lower edge of the town. At far right in the distance is a new facility under construction for expanded cheese production. Sweets and chocolates, the coop sign. 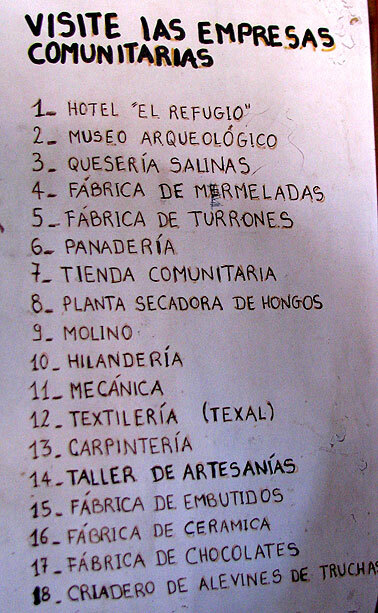 Our guide took us around the town, dropping in on a half dozen of the local cooperatives. 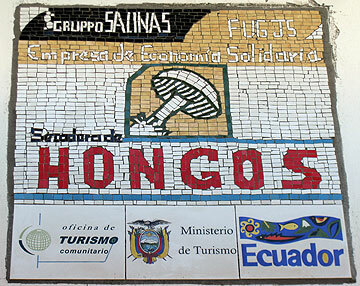 Getting the lowdown on Salinas as a Ecuadorian model of alternative development. Saltworks and chocolate factory in background. 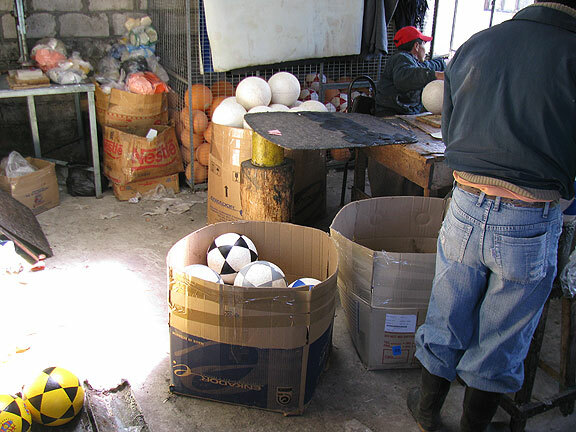 There's even a small soccer ball factory, selling their balls all over Ecuador and Peru. 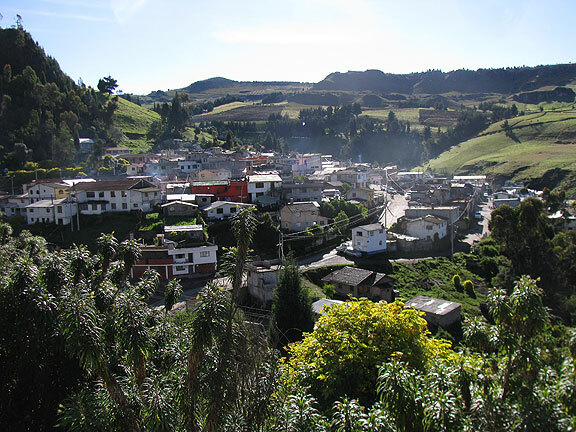 It was well ventilated since they worked with toxic glues in making the balls... just outside on the balcony a dozen guinea pigs were kept, a common food ("cuy") in the Andes. 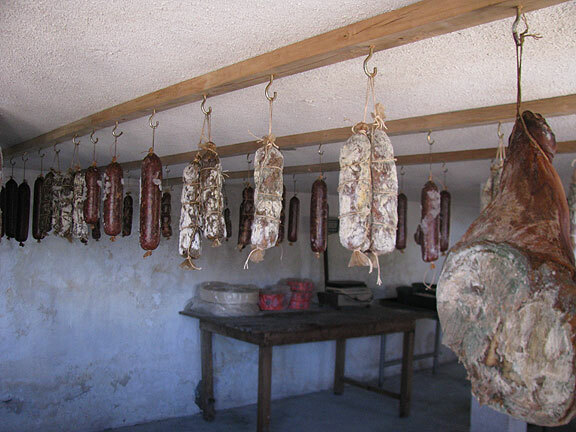 Drying salamis in the basement, while upstairs everything was gleaming stainless steel, super clean. 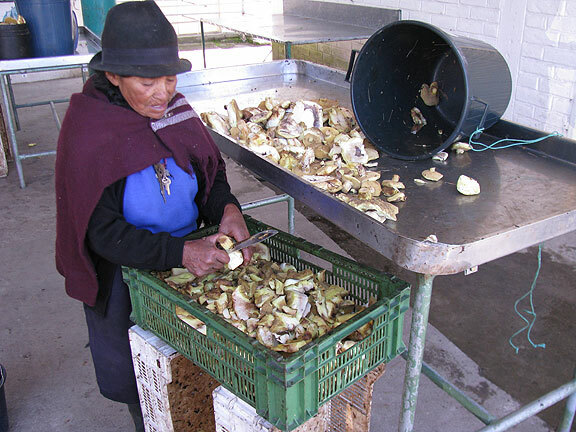 Mushroom coop: wild porcini and other types are gathered by locals of all ages and brought to this facility where dried mushrooms are prepared for domestic and international markets. First the fresh mushrooms are hand processed. Inside giant dryers are used to process the mushrooms before packaging. 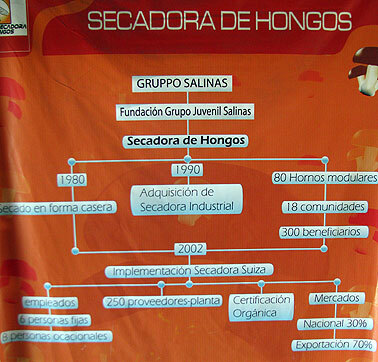 Most of the coops had big posters displayed prominently showing the structure of the operation. This shows another intervention by Swiss technology which also helped gain organic certification in 2002. 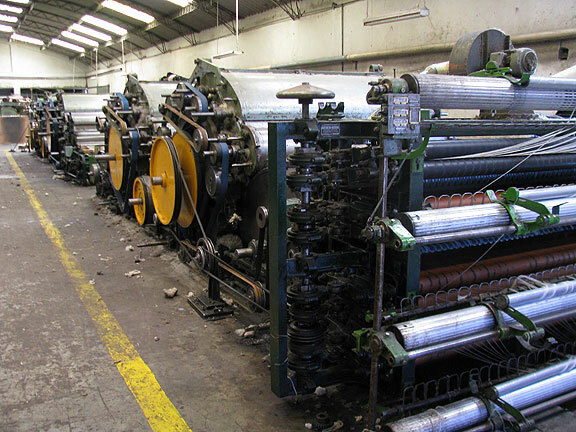 They spent $150,000 bringing old textile machines from Canada and the northeast of the U.S. to Ecuador where it's all still working. 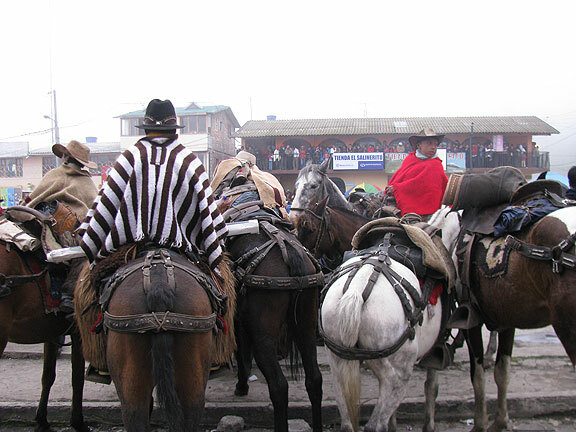 The textile coop, which produces alpaca yarns, finished garments, blankets, and rugs. 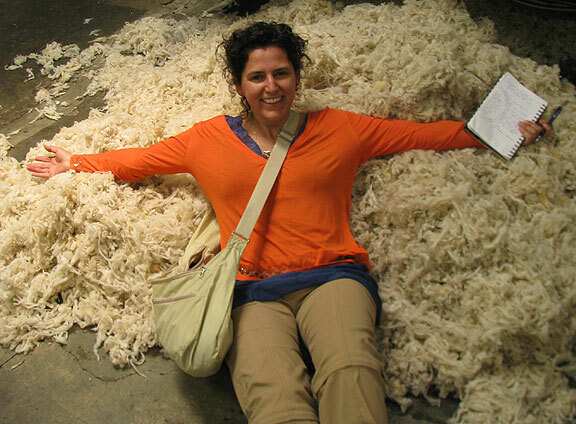 Adri takes a dive into raw alpaca wool, super soft! 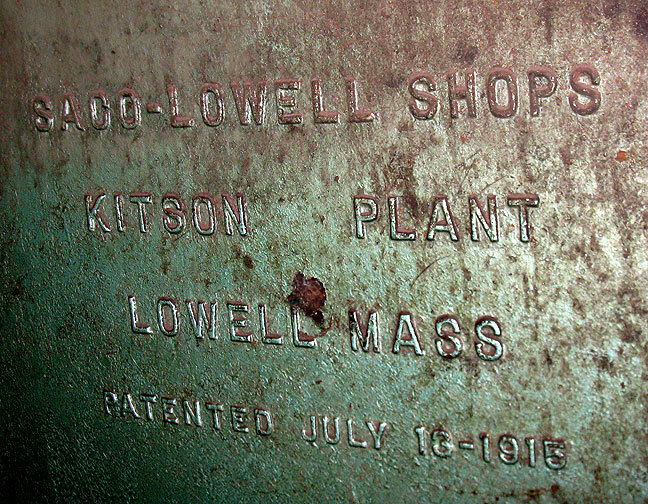 Upstairs in the textile mill (an impressively large cement structure itself) we came upon the oldest equipment used there, including this old loom which came from Lowell, Massachusetts where it was built in 1915! 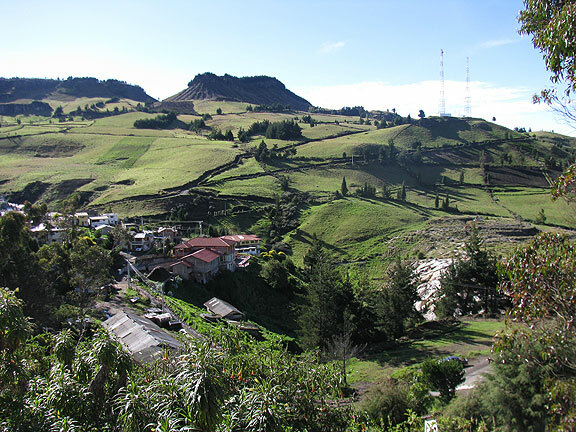 Imagine a machine made within three years of the famous Bread and Roses strike a few miles away in Lawrence, Mass., still churning along a century later in a town of self-managed coops in the Ecuadorian Andes! Strange loops of history, indeed! 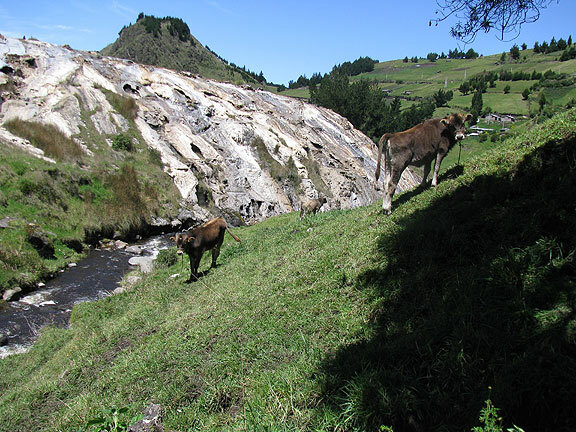 The white hillside behind these bucolic cows is the old saltworks, now run cooperatively. The weather just got nicer and nicer during our tour. 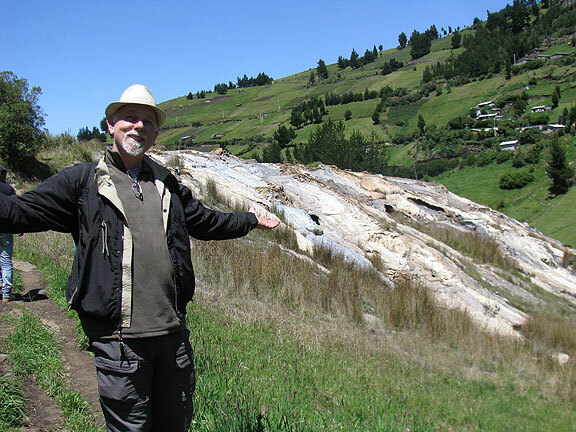 We got a rundown on how the saltworks used to work, with individuals jealously guarding their little areas, carefully washing water through and then getting the salt from slow evaporation. 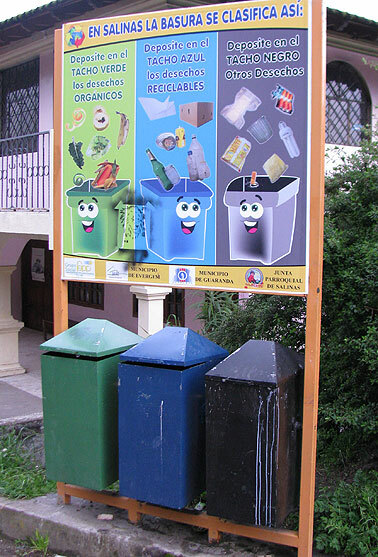 Not quite curbside pickup, but separation of waste materials seemed well integrated into the daily life of Salinas. 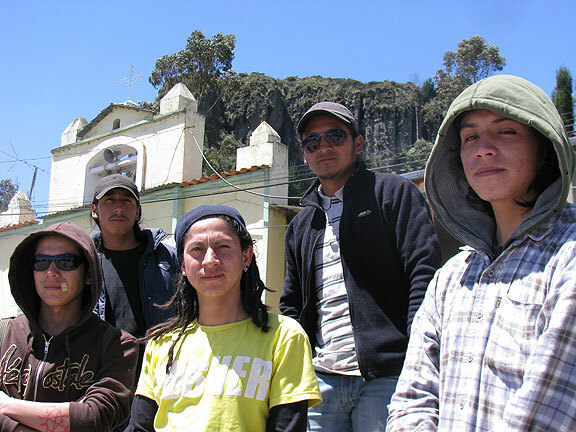 Our tour ended in the main plaza where we found some of the local youth we’d met the day before. They’d been selling chocolates to raise money for a new cultural center they were determined to build in Salinas. Father Antonio Polo was an inspiration for them too, though part of their mission was to shake up the staid, predictable lives they were leading in Salinas. They wanted a place for youth to make music, video, photography, and other arts, and to interact more with cultural impulses from other parts of the world. They were very smart, well informed, globally conscious, and clear that they had something special already in Salinas that they wanted to make deeper and better. Not surprisingly, they're a band too! and knew just how to strike a pose for their album cover! Father Polo is still around, about 85 years old, but unfortunately he wasn’t in town the day we were there, so we didn’t get a chance to meet him. Hopefully we’ll go back and he’ll still be there, and the thriving scene in Salinas will only be all the better for the passage of time. We loved it! 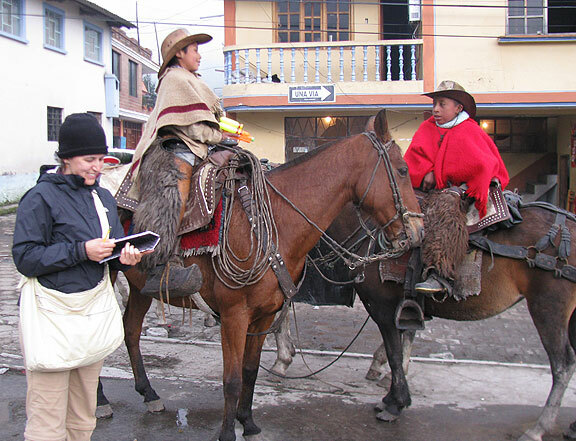 Intrepid reporter Adriana gets the scoop from a couple of young horsemen! 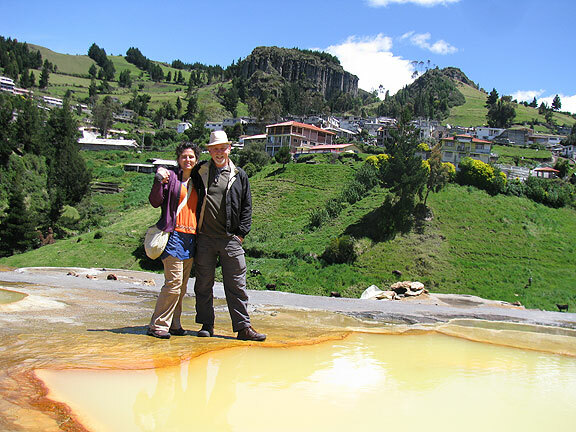 You can make trips around Salinas landscapes, climb and ride across nice routes between towns near the village and see beautiful mountains, natural plants and little birds, and the salt-water fountain. 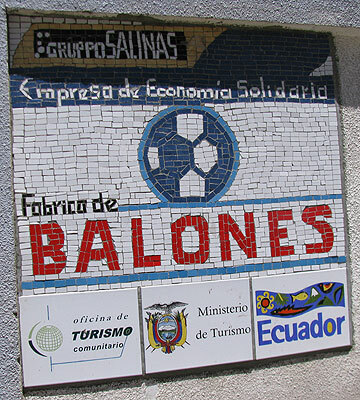 A couple of days in Salinas were among numerous life-shifting experiences of 5 weeks “S of Equator” July/August 2013. 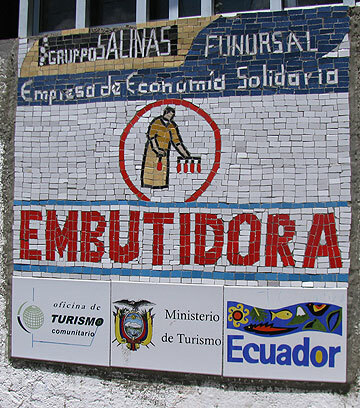 My wife, Cheryl Pomeroy, PhD, documented the salt making process with Otilia Chamorro in 1988 and published this in detail, including chemical analysis and likely recognition of this salt’s efficacy in preventing illnesses > The Salt of Highland Ecuador: Precious Product of a Female Domain, Cheryl Pomeroy, Ethnohistory, Vol. 35, No. 2. (Spring, 1988), pp. 131-160. .
Friends and relatives were delighted with gifts from Salinas which included finger puppets, we munched a disk of cheese all the way to Arequipa, Peru, and welcome our Chullos in bitter Chicago winter cold. 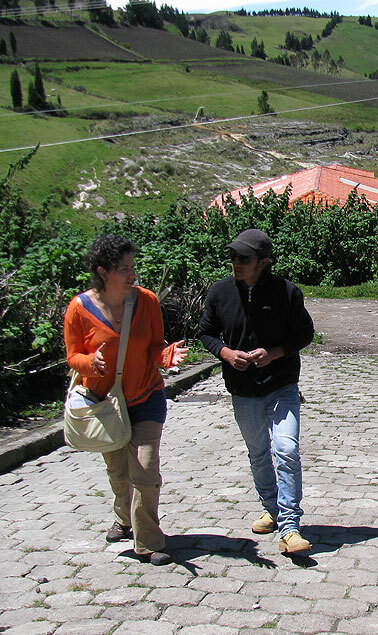 Thanks to Patricio of Salinas’ Turism Bureau for arranging Otilia’s grandson to guide us among the cooperativas! 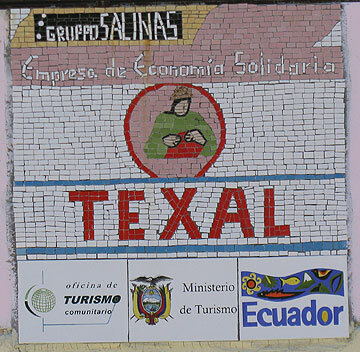 I’ll be going to Salinas this coming February, what time of the year is the carnival? The town looks great, i’m really excited for my visit. Very nice article about the little town, where I live. So you are invited again to visit us in next time. Inspiring to see and to know such places exist. que lindo – como me gustaria haber estado alli con ustedes! Excellent report – it’s almost like having been there. Brilliant!! Could be great to connect them with other Spanish speaking cooperative groups from Europe and Latin America! !